Shadera welcomes you to the new eon of shading. 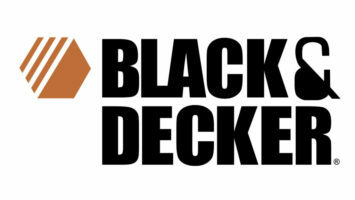 We are a company specialising in sun sails, shade ports and carports. WELL SAY GOOD BYE TO SPENDING DAYS AND SAY HELLO TO SAVINGS. HELLO SHADERA. We will strive to give you the client a project delivery experience that makes you smile. And glad you chose us, to work with again, and feel that Shadera is a company with whom it is easy and pleasurable to do business with. 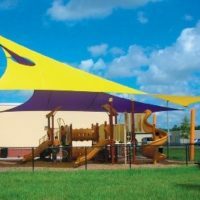 While we offer one of the most comprehensive warranties in the business, shade sails and shade structures can wear down over time. Components such as stitching, connection hardware and cables can fail over time. This makes it possible for one person to without effort remove and to re-fit and tension the canopy. 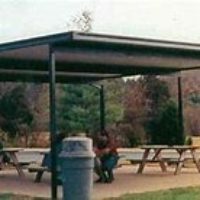 There are a variety of sunshade products which address the need to provide shade for the above applications. However, none currently exist on the market. Which includes a simple, self-contained mechanism which allows for fast and easy removal and re-installation of the fabric canopy. SHADERA can. This remarkable design makes it possible now for only one person (JIP!! only one person, no spelling fault here.) 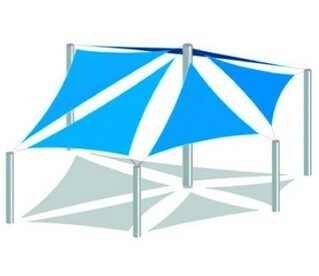 To effortlessly remove fabric canopy, in the event for cleaning, changing the colour, etc. And to re-install it effortlessly. 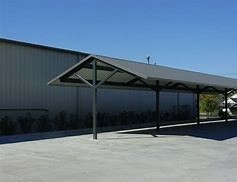 In the unfortunate event that your fabric canopy gets damaged, you discard the damaged fabric and contact one of your friendly Shadera staff, and we will supply a new canopy with your exiting dimensions. PRONTO. You may even without charge change the colour if you feel like it. 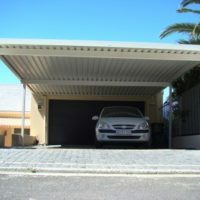 Think bright you can now buy one carport with a variety of colours fabric, change colour daily weekly. Break the boredom be Shadera creative. We are also specialising in giving new life to a run-down shade port. And YES is possible for our Team to install our Unique Tensioning device on your OLD sun port structure. And install our designed canopy. At a fraction of the cost your old sun port will look new in no time. And best of all you will be able to change your canopy yourself in the future. 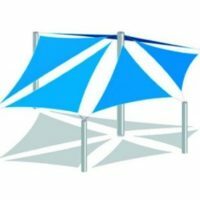 Shadera sun sails can become any shape you desire to cover your space and can be easily installed and removed for cleaning. Shadera sun Sails are manufactured with commercial grade shade fabric, it comes with webbing reinforced corners, marine grade polished turnbuckles for each corner, and marine grade polished stainless steel corner rings, reinforced with UV resistance thread and a double row of locking stitch (not a chain stitch used by our competitors). Hardware is load rated and is intended for tension. We only use highly polished marine grade stainless steel. If it’s good enough for the ocean it good enough for us. 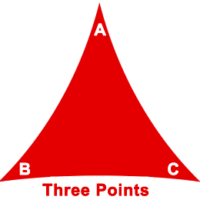 WHAT IS THE SHADE SAIL? Sail Shade adds a modern, stylish touch to an outdoor area. They’re a great option when you are considering ways to provide shade. You’ll be able to escape the harsh sun while still enjoying the feeling of being outdoors. 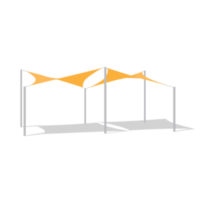 Sun sails offers you freedom from relying on dated awning structures or unimaginative patio covers to meet your shade requirements. 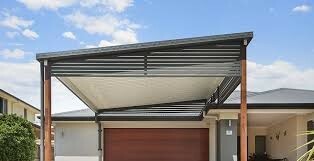 Sun sails shades make an impact in any outdoor space with their modern design and flowing lines. We also offer you a wide range of shade cloth, and colour preferences. Not only does the cloth have a very strong knitted construction, the fabric also allows a shade sail to breathe, meaning that air can circulate through the fabric to create a much cooler environment beneath. 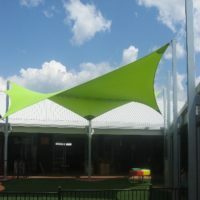 An attractive shade sail will add prestige and value to any property and is an affordable and clever way of providing shade for children at play and protecting your friends and family. 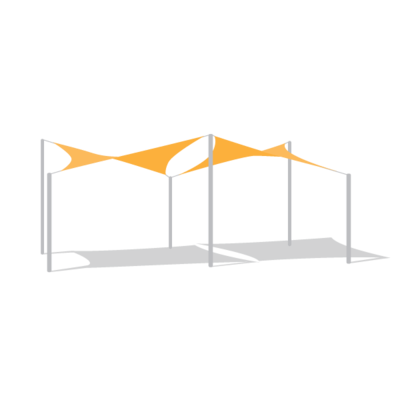 Shade sails also offer fantastic protection from harmful UV rays for your possessions and they make good business sense when installed in an area where you can give cooling shaded relief for customers and staff. 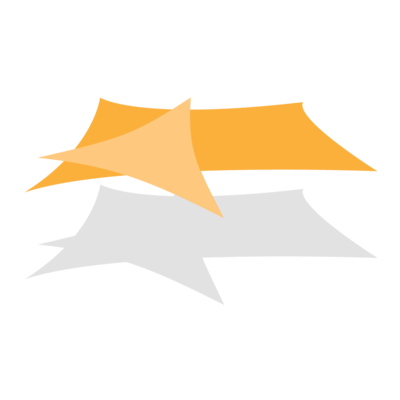 Custom made, unique and effective design with shadow prediction. Shadera only use materials of the highest quality in their installations, including all the fixtures and fittings. The installers are efficient, clean and polite, ensuring that the whole process of installation from start to finish is worry-free. 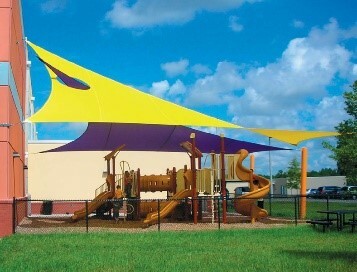 Shade protection for children’s play areas, sandpits, climbing frames, etc. – The net is then affixed to the frame with 12 mm ski-rope. Shade ports usually require little or no maintenance at all. In the event of damage as result of extreme weather conditions or misuse, nets can be replaced as a relatively low cost. 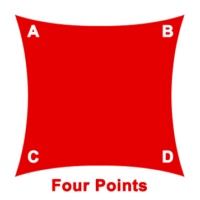 This structure consists of 4 upright columns – one placed at each corner of the structure. Can be supplied in either domed or A-frame design. This structure consists of 2 upright columns at the back of the structure which allows for total access when turning into the parking bay. As there are no columns at the front of this structure, the possibility of accidents is greatly decreased. Can be supplied in either domed or A-frame design. 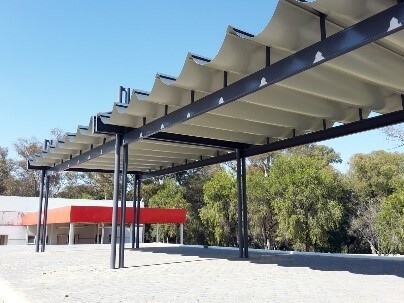 This structure also consists of 4 upright columns, however the 2 front columns are slightly receded which improves ability to enter and exit parking bays without incidence. Can be supplied in either domed or A-frame design. As the name suggests, either the entire structure is mounted to a wall using rawl bolts, or only 2 columns are used for leverage and the other side is wall mounted. Can be supplied in either domed or A-frame design. Can be supplied in either domed or A-frame design. 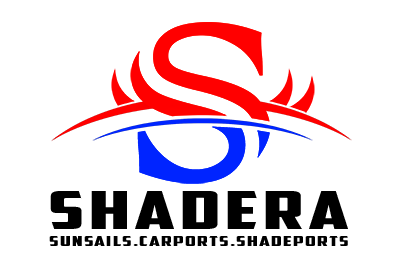 Shadera only uses materials of the highest quality in their installations, including all the fixtures and fittings. The installers are efficient, friendly and polite, ensuring that the whole process of installation from start to finish is worry-free. Our after-sales service is second-to-none. the whole process of installation from start to finish is worry-free. 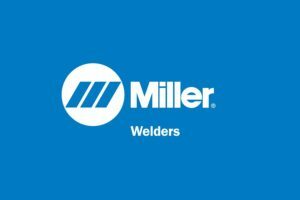 Our after-sales service is second-to-none. 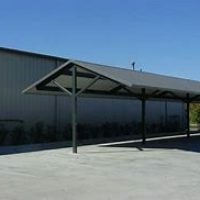 Our premium metal carports are the most durable option and provides the best protection for your vehicles. 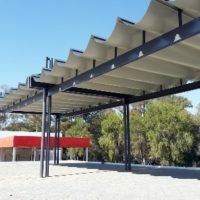 Steel carports require very little maintenance and therefore offers the highest quality and best value for money over the long-term. 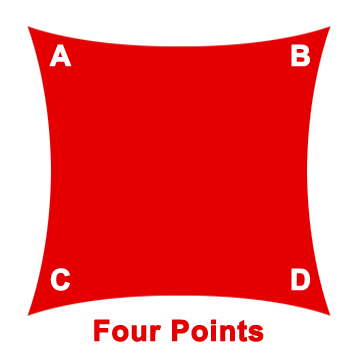 We offer the following product types, but we also specialise in custom designs. These structures can be free standing or connected to the side of a building. anything else that your lifestyle demands. 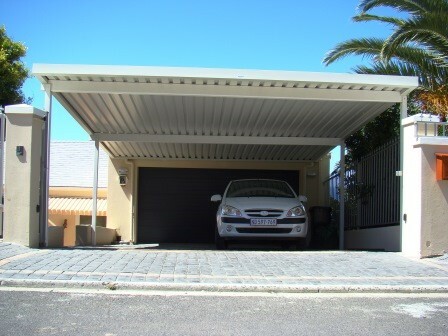 Shadera steel Carports come in a variety of styles and are made to fit any size that you require. 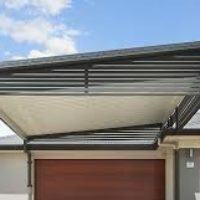 All of these describe a Shadera steel carport and the advantages it offers you and your property. All our metal carports carry a 7-year warranty. Our maintenance program includes washing and retreating your fabric canopy, with an appropriate cleaning solution. If necessary we will take down your canopy cover and re-stitch seams, replace binding and check for rust on the frame and hardware. Such areas should be promptly scraped and painted, as rust may discolour and deteriorate fabric coverings. We believe comfortability must not be costly. prevent corrosion and wear of the framework, fasteners and finish. Salt/sand corrosion, “pitting” of the framework or finish, and other environmental damage are not considered manufacturing defects, and are not covered under manufacturer’s warranty.